#1 - A gift card to a local bookstore. Yeah, you may think it's otherwise boring or impersonal but a gift card to Amazon.com, Barnes & Noble or Borders is a book lovers dream! The freedom to go in and pick any title of their choosing!? Be still our book beating hearts! #2 - i-clips from Peter Pauper Press. These packages of i-clips are available for $3.95 on Amazon and they had a nice variety of designs to choose from such as the Floral Silhouette design , Calligraphy , Owls , Butterflies and Skulls i-Clip Magnetic Page Markers (Set of 8 Magnetic Bookmarks) . Couple one of these with a gift certificate to Starbucks (or your local coffee shop) and you've just made a book lover's day! These i-clips sure beat out the scraps of paper most of us readers usually tear up and use to bookmark remarkable passages in the books we're reading. I use my i-clips ALL THE TIME and heartily recommend them! 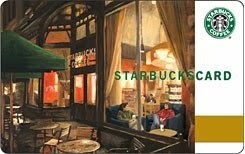 #3 - A gift certificate to Starbucks (so that we can stimulate the brain in more ways than one!) Some book lovers really love the environment of the coffee shop and the treat of some time away from home to just sit down and relax with their beverage of choice. It doesn't have to be Starbucks. What is your book lover's favorite get-away spot? Again, a $5 gift card and a package of i-clips is one of the best gifts I can personal imagine because it equals time away and alone and I can easily keep track of passages in a neat and orderly manner! Love it! #4 - One of my best book gifts that I ever received was an Insta-Tote Bag (Patty Reed Designs.) May I interject a comment on their website? They need some work! 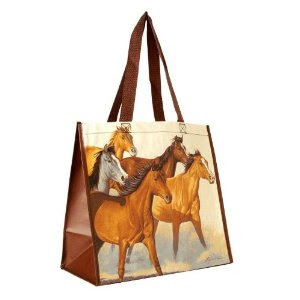 )You can find these bags on Amazon as well. The durability of these bags is amazing. I use mine for library visits, specifically, and have managed to cram in and lug out up to 50 books at a time. These bags are STRONG! Plus, they double for grocery bags and anything else you can think of! I believe I've had my bag for 2 years and I liked it so much I bought another! 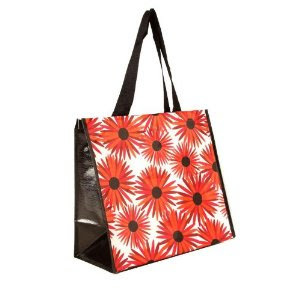 They are reasonable priced and come in a variety of different designs. #5 - Journals. Most readers I know of also love to write. The power of words can be overwhelming at times and I appreciate having journals to write down interesting quotes, books I want to read, words I hear (i.e. sermons and speeches) and, of course, my own personal thoughts. Again, Peter Pauper Press has a fabulous selection of quality journals (and recently sent me a couple to check out.) 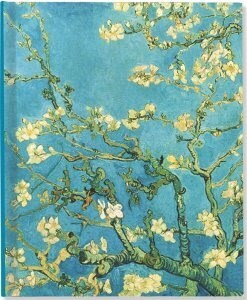 I was sent their Almond Blossom Journal which is over-sized version. Admittedly my hand writing has become larger and more sloppy with age and children and lack of time so I rather appreciate the extra large pages for writing in. This journal, like their others, is quality bound and this particular style includes a bound-in cloth bookmark to help you keep your place. In addition to the over-sized journal, I was also sent the Twilight Garden Journal which is more the size of a traditional diary and has a bound elastic band attached to keep it closed when not in use. Are there items that you would add to this list? 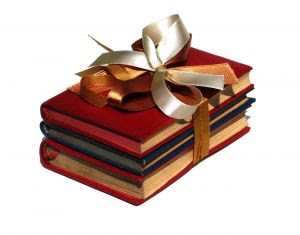 What would you all, as my fellow bibliophiles recommend to your friends and relations as good gift items to those of us who enjoy keeping our noses tucked away in books? And I agree...I goft card to a bookstore is a book lovers dream! Great list here! Good ideas! Though I appreciate when someone want to give me a book because they know I love to read, it is disappointing to receive a book I've already read -- and even those in my own household probably have little idea what I've read already. I agree about gift cards -- love them!. I've never seen i-clips before. The only other book-lover gift I can think of it, for those who might like to listen to a book on a iPod or something, is audible.com. One of my sons got my husband a subscription one year for one ree download a month. The only other suggestion I can think of is a hot chocolate gift pack - a nice mug, hot cocoa, and marshmallows. Goes along with the Starbucks idea but allows the person to stay home if they don't feel like going out. I love the iclips! I don't yet have any, but I want to get a set. Love those ideas! Esp. Cassandra's - I think that's a thoughtful gift. Thanks for sticking it out there! Gives a little variety. I asked for a book light this year...the ones I've had in the past just didn't cut it. It can even act as my bookmark! PS. Lots of people already have book lights though, so maybe it's not a great gift idea. I think I'm one of the few book lovers who does NOT drink anything from starbucks. Yuck! I would add Moleskine to the list of journal ideas. Moleskine products are well made and offer great flexibility for those who want to personalize. I tend to dislike a journal that has too many guidelines built into it (even a "themed" journal -- such as a fitness journal). Moleskine products have sections for creating specific notes but provide more opportunity for personal preferences in adding info. Small gift ideas for book lovers can be bookmarks. I've received a number of lovely bookmarks over the years. Best of all: they never go bad, and anyone who reads will be able to reuse the bookmark again and again. The ultimate recyclable? And I completely second the Starbucks gift card idea. I'm afraid to find out how much I spend there annually. Those I-clips are pretty cool. It can be so hard to find new gifts for book lovers, but you've given us a head start on holiday shopping. Thanks for posting!